When I thought it through, I didn’t have another option but to agree with that. How to copy your competitors and deliver their plans better on the market. How customers make a decision about you or your competitors? Which brand they will follow and admire more in a conflict? Even Mailshake and Autoklose instead of Mailchimp. Subconsciously, not just because they have better products. There are many more reasons why we have our favourite brands, which hardly any one of us ever noticed. Honestly, how often have you seen an entirely new product on the market? It’s very rare. Probably, the last unicorn entering a “blue ocean” we saw is Airbnb. Let me tell you a little story about one of the biggest companies today. How they started and how they won the battle against the company who had much more customers and almost the same product. We all watched that film where Mark Zuckerberg wrote that amazing piece of formula on the window. But honestly, why did Facebook win the battle against MySpace, even if they had a similar software? MySpace probably had better software at the time, since It is much older than Facebook, but Facebook had a better story and mission. MySpace introduced to people the World of Social Media, but Facebook truly connected them among themselves. Facebook had a better amplification and product distribution covered with their main mission: to connect people from various parts of the world. The best product doesn’t always win. The best amplification, distribution and the stories of our brand that we’re publishing, win in the most cases. People tend to persuade you and convince you that you must write content every day, that you must provide value and other irrelevant things. Yes, you must but it’s just not enough to write it down or record it. 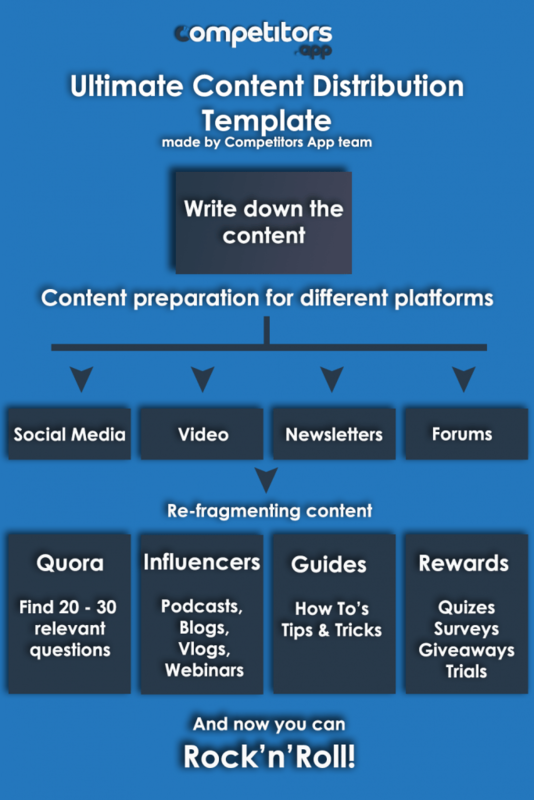 You’ve probably realized that best content marketers write less content than other people. Why? Because they have a good preparation and distribution of the content itself. One article with great distribution is worth more than 7 articles with a poor distribution. In a short time period, you will get bigger traffic and better results. One piece of Content can be used in different ways. Writing content doesn’t only mean publishing it on your blog. It also means publishing it on your Social Media and distributing on other platforms like Quora, Reddit, Medium, etc. Also, one content can be re-fragmented into different types of smaller stories, how-to’s, surveys, playbooks, exclusive offers, etc. You can play with it however you want. Or, when they have exceptional customer support which is solving your problems in a matter of minutes, instead of waiting two or three days. Your customers appreciate it when you take care of them. It gives them a feeling that they are just as important to you. Slowly, you will become their friend. Let me tell you a story about one of the fastest growing online communities on the Internet. When Josh started building Badass Marketing and Founders he had zero members. Several months later the community reached 20.000 members, who love BAMF and engage with their content every single day. Josh and his BAMF team cared about us. They were creating an interesting content, solving our problems, detailed guides with videos about how to get things done and they gave us their full support. Be the most loyal and reliable „friend“ to your potential customers. Show them with material evidence that you are better than your competitors. Identify the biggest problem of your target audience and find the solution. Reach out to your potential customers via Social Media (Not Emails. We create real and closer relationships through Social Media channels like Facebook or LinkedIn). Convert them to your trial customers. Convert them to your paying customers. How can you actually „spy“ on your competitors? A lot of people find this a very problematic topic. “Is it legal?”, they asking me. Of course, it is! There’s nothing bad about this way of observing your competition. They are your competition, and it’s your duty to learn bad and good things from them. But, how can you actually do this? It’s not as complicated as it seems. First things first, before you even start monitoring and „spying“ on your competitors, you need to know who they are, right? While reading this article, you probably already know who your competition is. But there are huge chances that you missed someone very important. When my friends and I started my first business, I developed a platform which would help people find the best bars and restaurants in one place. I have never imagined that my biggest competitors are actually Facebook and Google. We have spent several hours looking for similar websites. In the end, I found 10. When we have celebrated our semi-anniversary, we realized that we have at least 20 competitors more. Lesson: If we found out this number of good and established competitors, we probably wouldn’t start our business at all. Always do your homework and research at the beginning. Later will be too late. A few months later – we have failed. Competitive and Customer research. Why it’s so important and how to do it with no pain! There are plenty of ways to „spy“ on your competitors, but, what’s the best way to do that? Obligate your employee to follow and watch your competitors’ Social Media every day. Check your competitors’ content and Page Sources of their website to see on which keywords they are paying attention and what content hey are producing. Request a Demo account from Competitors App already filled with your competitors, and save 97 minutes of you and your team’s every day. Yes guys, it’s our software. But even if it isn’t, we are proposing you to try Competitors App. It really rocks! Knowing who are your competitors is good, but knowing what are they doing and what are their strategies is even better. Monitoring your competitors with Competitors App is very easy. Here is the step-by-step guide to how you can do it. Create your free 30-day trial Competitors App account here. After you have created your free account, on the left side of your dashboard, you will see a button called “Edit domain and competitors” (illustration below). After you clicked there, on the up-right corner of your dashboard you will see a button called “Add Competitor”. Click here, and fill in your competitor domain. After you have finished entering competitor domain, click “Next” and Competitors App will find all relevant URLs of your competitor you can monitor. Click “Finish” first, and later subscribe to your competitor newsletters with the emails they mentioned in the alert. In this way, you will start tracking their newsletter campaigns (Don’t forget to adjust this. It can be really helpful). From the moment you add your competitors, the software will automatically start tracking them non-stop, and you can see your notifications on your timeline. Voilaa! After you have finished everything, you can see your competitors’ online activity in your dashboard, it’s time to do some monitoring! Here you can find a more detailed guide for monitoring your competitor keywords. „Spying“ on your competitors and stealing their customers isn’t illegal. Isn’t forbidden. It’s desirable. You already know how to „spy“ on them, monitor and track their online activity. But, how can we actually recapture their customers? Yea/Yes, you heard this hundred times at least. But don’t skip on this. I’m giving you advice on how to do this. At the end of the day, it’s all about the customers. CUSTOMERS ARE ALWAYS RIGHT! They are your bosses. They are the ones who are in command. You just need to find better ways from your competition on how to do it. First thing first – find your customers biggest pains and solution on their problems. What are your biggest troubles about the [problem]? How often do you face this problem and how much the solution is important for you? What’s your solution to the [problem]? Are you already using some software which helps you to solve your problem? Are you using [your competitors’ products] and what’s your opinion of/on them? Pros and Cons? What do you think about the product which will solve [your problem solution]? Mindstorm for one hour and write down all the good questions you can ask them. Select 7 to 12 best questions which will give you consistent answers. Interview 5 to 15 people of your competitors’ customers. If you live in a big city, try to find the best gathering places. (Do your research!). Create an online survey and interview 20 to 30 of your competitors’ customers. For creating the surveys, offer your potential customers some rewards for completing them. It can be some content, branded spreadsheets, giveaways, your product extended trial or discount, etc. Feedier is good software for this. Check it out! Make your surveys engaging and entertaining. Scrape your competitors’ online community members data, and reach out to them (Send 50 to 100 messages, because you will for sure have some bounce rate). Find your competitors’ product on Product Hunt, AppSummo or some other platform, and message to the commentators. They are very likely (or they were) customers of your competitors (You can even find there some pros and cons their customers already mentioned). We need to create a real relationship with our potential customers. If you want to be really better than your competitors, then ignore almost everything you had learned before. Emails are not good for that. They are too much cold. You need to create a warmer connection with them. Use your LinkedIn and Facebook instead. Again, scrape your competitors’ online community members – Their names, Facebook or LinkedIn URLs and emails (they will be useful later). Auto connect or send friend requests to your potential customers. Make personalized messages as much as you can. Mention something you have in similar or mention the problem. Don’t forget to offer your help (never underestimate this. It’s one of the most important things I learned in my life – Help someone for free and it can only benefit you – with hundred times bigger value). Start creating and publishing relevant, engaging and problem-solving content on your LinkedIn and Facebook, based on your research about the market and your customers’ problems. I hope [content name] can solve your biggest troubles! Would you like to speak via video chat or to send you an email with detailed instructions? By now, you already know who your competitors are, how you can monitor them, and you know your customers very well. But, is that enough to win the tough battle against your competition? What can you do to keep your customers? What can you do to find new ones? You are building a SaaS tool for monitoring websites backlinks. You are ready for your initial outreach. You found your potential leads with FindThatLead, and now you are prepared for sending cold emails! You have just sent your first campaign to 1000 potential customers. But, wait! Your open rate is 3%! The second campaign – your open rate is 3,5%! Pay an expert with money you don’t have. See how your competitor is doing things right. Option 1 can be powerful but expensive. Option 2 is a good thing to do but it’s too slow, and you will spend a lot of time figuring out what’s working and what’s not. But, option 3 will save you both time and money (In the business, time and money are equally important resources). Inside your Competitors App dashboard, you can track your competitors’ newsletter and email campaigns. They already have successful copies and templates. Edit a template a little bit with your previous knowledge of potential customers behaviour and problems, and you will have a good email copy ready for the outreach! This is an example of a successful competitor monitoring and creating competitive strategies. This is a classic example of the competitive strategy. Quality is almost always better than quantity. You have done your competitors’ customers research. They have filled your surveys and now you have the valuable feedback. Use it best as you can. Your competitor has a big customer base. It’s successful, but, you found out that their customers use only two to four features instead of fifteen. Their dashboards are slow and crowded with unnecessary things. Build a simple dashboard with just the features they are using. It’s not a secret that the company who love and care about its customers is always the first choice in the peoples’ eyes. As I mentioned in the paragraph above, show them that you are thinking about them day and night. They will appreciate it. From your customers’ survey, you know what are their biggest problems. Create content which will suit them best! Find the best places on the internet to distribute your content, so you can have a widder reach of your most ideal customers. At the end of the article (or at the beginning), offer them some free templates, spreadsheets or maybe outreach templates to catch their attention even more. Customer Support is what sometimes matters the most. Be available for your customers 24/7. What most people hate, is when they need to wait for the response for several hours or even days. Respond them in minutes – literally. Maintain your value and competitive edge. The last step but not the least important. Always keep the same (or even better) quality of your services or your product. Maintain your competitive edge, and monitor your competitors every day, so you can find new opportunities to beat them. The best product doesn’t always win in the market. Define your ideal customer persona as much as you can. Find their problems and biggest troubles, so you can find the best solution. Monitor your competitor every day, so you can find the best opportunities for the outmanoeuvring your competition. 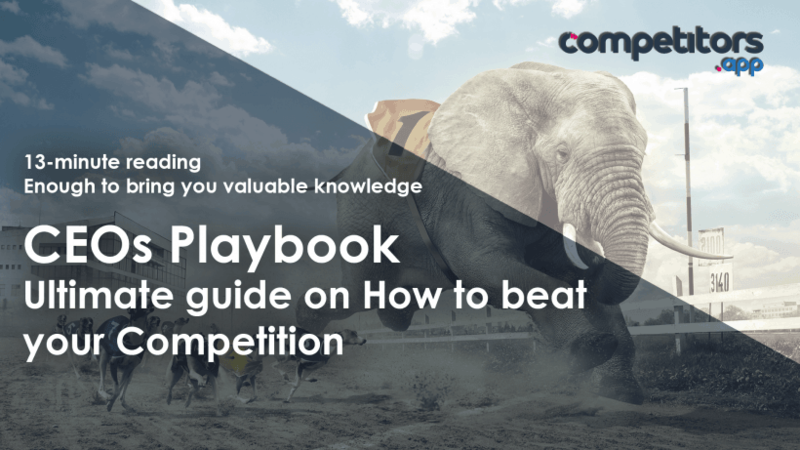 Create a competitive edge based on your knowledge from monitoring your competitors. Always maintain the same or even a better value.